The town of Hawkins is beginning to get desperate in their search with older brother Jonathan (Charlie Heaton) searching out his estranged father, Mom Joyce (Winona Ryder) quickly losing it, and Chief Hopper finding out that recently found dead diner owner Benny (Chris Sullivan) saw a child the day before. With no one home in the Byers house, the government scientists show up and find monster residue in the shed where Will was caught. Barb wakes up covered in fluids in some underground monster dwelling and is stalked by a monster while juxtaposed to Nancy and Steve getting it on. It feels as if every second of this series is an homage to some great movie from the 80s. Is Nancy named for Nancy from A Nightmare on Elm St? The music in the opening credits is a dead ringer for Carpenter’s The Thing score. For the average TV watcher looking for the next great show, this is exactly that, a great show. But to the people who grew up watching Carpenter and Spielberg, and reading Stephen King… it takes the series to a whole other level. Take for instance a scene where Mike, Lucas, and Dustin get ready to go after Will. I’m literally calling out the references – slingshot (IT), Pez (Stand By Me). Joyce is convinced she can speak to Will through electricity (Poltergeist), and decks the house in Christmas lights. When Mike’s mom visits with little sister Holly, she getting dazzled by a charming light show (cough, Close Encounters). Hopper and the police investigate the research facility and they are definitely hiding something. So they hit up the library… 80’s STYLE! We’re talking dewey decimal system, microfilm, and microfiche. The lab was involved in testing kids with experimental stuff, and Brenner was named in at least one lawsuit. Nancy is freaking out about Barb’s disappearance. Her new friends find out about Jonathan’s photos and bully the kid with the missing brother. The gang is on their quest along with Eleven. We see through flashbacks Eleven being tested and tortured in the facility, until she snapped and killed two guards, much to Dr. Brenner’s delight. Eleven takes them to Will’s house but before they go in, a caravan of cop cars, and ambulances drive by and they frantically follow. Had they walked in, they would have seen Joyce, who developed a way to talk to Will by painting the alphabet on the walls under Christmas lights. He spells out R U N, and a monster rips through the walls. The title here is a nod to Stephen King’s original title for the novella that became Stand By Me. The opening pre-credit 5-minutes are some of the best I’ve ever seen in any medium of TV. Winona Ryder is well on her way to an Emmy nomination if this keeps up, and Dan Harbour’s Chief Hopper is quickly becoming one of my favorite characters. Hopper lost a daughter years back so he’s trying to be empathetic, but she’s convinced, body or no body, that everything happened exactly like she said last night. She was communicating with Will using Christmas lights until a humanoid monster burst from the wall. The monster and her descent into madness are all very Lovecraftian. Another phenomenal emotional wrenching scene is between her and older son Jonathan, who is trying to rationally plan for Will’s funeral, while his mom is refusing to accept that the body is even Will’s. We finally get a little more about this monster. The scientists at the research facility send a man INTO the center of a tentacled mass, is it the belly of the beast or a portal to another world… all we see is Dr. Brenner looking on anxiously. Just inside the rift though, the man is attacked and when they reel him back, nothing but a bloody clasp remains. Meanwhile, the kids dress Eleven to look like your average pre-teen girl in 1983. Mike’s reaction is classic, “you look pretty… good. Pretty good.” At a school memorial service, some bullies get in Mike’s face and mock Will, but Eleven stops one in his tracks literally, and he wets himself in front of the whole school. Nancy meets with the cops to discuss Barb’s disappearance and the thing she saw. She’s convinced something horrible happened, and notices a shadowy figure hovering over Barb in one of Jonathan’s ripped up photos. Hopper is on a crusade now. He knows he was lied to by the Hawkins Research Facility, and he beats down the guy who found Will’s body, bottomline, there is some big conspiracy going on and he knows it. “You’re gonna get us both killed,” says the guy as a strange car spies on them, then drives away when spotted by Hopper. 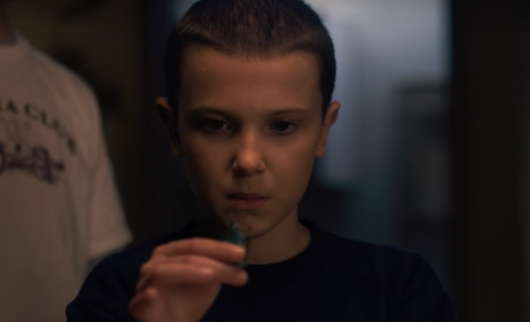 At the same time, Joyce and the boys with Eleven try to contact Will. They use the AV-Club room in school and use El to find the frequency and then it happens… they all hear him. Joyce in her home, the kids at school all hear him cry out for Mom. When she rips the wallpaper away, there is the pulsating rift entrance… the monstrous portal that the scientist walked into never to come out of. And Will IS THERE! Something is after him, and soon the wall returns over where the rift was. Gone for now, again. Hopper goes to the morgue to see Will’s body and sure enough… Joyce might not be crazy after all. After finishing the first half of the series, I am in total awe. Every aspect of the show is utterly perfect. Sure, some may find that the homages are too much, but when you take in all the inspirations the Duffer Brothers are borrowing from, it comes across as something unique and different. Consider this, Steven Spielberg produced, and JJ Abrams wrote and directed Super 8 back in 2011, a film which tried to genuinely create a new story using the same themes and borrowing from the same inspirations. The Duffer Brothers have outdone Spielberg AND Abrams. Super 8 never reached full potential for me. This show had me hooked on music, feel, and look before I ever saw an opening credit. Every frame is set up to evoke a memory and an emotion. The acting, especially from the kids is fantastic, but Ryder and Harbour lead a terrific adult cast as well. I’ve been moved to tears, laughed out loud, and jumped while watching this. This show is what everyone should be watching. It appeals to every demographic, on every level. If you haven’t figured out yet, I LOVE this show. Stranger Things is streaming on Netflix right now.